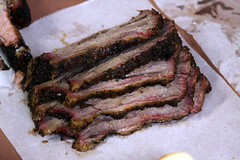 My visit to City Meat Market was part of the Central TX BBQ Run. After a very thoroughly satisfying BBQ breakfast at Snow’s BBQ, the question came up regarding which BBQ joint we should do next. About half of our crew had been to City Market in Luling, TX on Friday, and decided it was worth a repeat trip, especially for exposing those of us that were late arriving on the BBQ Run. But the drive from Lexington to Luling is a long one, almost two hours long. We decided that it would be irresponsible to go on such a long voyage without some sustenance, so we decided to stop off at City Meat Market in Giddings, TX for some more barbecue. City Meat Market is distinct from most of the other barbecue joints this trip, since it’s actually a meat market as well a barbecue place. Walking in through the front door on Hwy 290 (instead of the well-weathered side door), the first thing you see is a classic butcher shop and a meat case (which is filled up with all sorts of meat that was insanely cheap by my Northeast-non-cattle-country-calibrated expectations). Sauntering through to the back of the store, you first come across a seating area that has “dive” written all over it. Slightly rickety tabled covered with cheap, slightly sticky and slightly discolored tablecloths, and surrounded by slightly rickety chairs. Each table is adorned with a single bottle of what was once Gallo Sweet Vermouth, but now has been transformed into a fairly delicious, and very spicy, hot sauce mix. To order up the food, you proceed back through the seating area to the door marked simply “In”, which takes you to the meat counter. Like everywhere else on the trip, you then order up your meat (like usually, the order here was a few pounds of brisket (a mix of lean and fatty end cuts), four ribs, and a handful of sausage links). More so than most of the places we visited, the woman serving up the meat here had it down to a ritual: Tearing a sheet of paper and placing it on the counter. 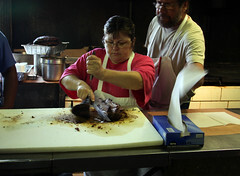 Grabbing of the brisket from the smoker. Slapping it on the counter, carving off several slices with careful, deliberate, slices (obviously, at City Meat Market, carving meat is serious business), eyeballing the total amount, and then weighing it up, possible with another slice to make weight, and calling off the price to be added to your bill. Then, when all the meat has been dispensed, gathering up the ends of the paper and handing the whole mess to you to carry out and eat. And unlike Kreuz, which featured a small, well-fortified stockade of stacked wood outside the establishment to run their smokers, the wood pile at City Meat Market appears to be brought in each day by the single truckload, and schlepped in the side door as required. It really gave the place a feeling that they people were “barbecue artisans” and not “barbecue mass producers”. As far as the meat itself? This wasn’t as good as Snow’s, but it was respectable in it’s own right. It sported a decent, clear, smoke line, and had a bark that was fairly substantial, but a little less tough than most places. The fat was rendered well on both ends, and both lean and fatty cuts were fairly flavorful, and a little moister than most places. The ribs were similar, with a nice texture, the not-quite-falling-off-the-bone texture I like, good smoke lines, and a nice rub flavoring everything. Nothing earth shattering, but certainly some good, well-executed barbecue where they haven’t cut any corners. Interestingly, the sausage here was quite good as well. 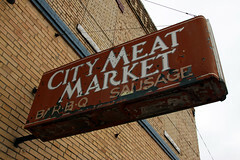 While it’s the exact same sausage as Snow’s was in the previous review (City Meat Market supplies the sausage to Snow’s), City Meat Market seemed to do a better job of it. The casing was a little less tough, the meat a little less greasy generally a lot more smoke. It was still very loose in texture like it was at Snow’s, but it held up a little better through the smoking and slicing. They really did a lot more to pull the taste and texture out of the same starting product. Overall, I rather liked City Meat Market. The food overall was quite good, and obviously made with a lot of care and attention. While not topping the charts in any category on this trip, they did a solid job across the board making decent barbecue.